In September 1993 I saw an ad in the ba.music newsgroup for a Mellotron for sale in San Francisco. Dirt cheap, $400. Of course I'm thinking, "Hey I've already got a 'Tron", quickly followed by, "But one can never have too many Mellotrons. Worst case, at this price I could use it for parts." So I drove up to The City, checked out the machine, wrote a check, and loaded this puppy into my Volkswagen Scirocco. The instrument sounded weak but worked surprisingly well given its condition. The cabinet was really beat up with an awful black finish. Inside all the tapes had been spliced, most metal parts were oxidized, and there was about half an inch of dust and insect larvae (yick!) on the bottom surface of the cabinet. Not a pretty sight. I knew full well there was a major refurbishing job ahead; maybe it could be fun. So I set up an area in my garage and over the next few months I ripped the Mellotron apart completely, down to every bolt, and cleaned and lubed each individual part. I used a vacuum cleaner, soap, a wire wheel on a bench grinder, WD-40, Naval Jelly, some industrial strength cleaner I don't remember the name of but I'm sure it made a dent in the ozone layer; pretty much every tool available. After disassembly I took the cabinet to a local furniture refinishing shop to have it stripped and refinished. This is the sort of task you want a professional to do. The biggest problem they had was stripping off the old finish. Apparently one of the previous owners didn't think the original white finish was hip enough, the fool, so he took a can of black spray paint to it. When he ran out of spray paint he used some other material. I think that other material was shoe polish, but the furniture refinishing shop folks think it was tar. Either way, it was pretty awful, and more difficult than expected to remove. Unfortunately I didn't think to take any "before" photos. They would have been pretty entertaining. A couple of months later I was finished. The process was hard work but the result is a very nice machine. Here's a photo. New tapes from Dave Kean. Choir / 3 Strings / Brass. I was in a Genesis, Strawbs, Lizard-era Crimson mood. One day, 28 December 1996, Michael Pinder came to the local Border's bookstore on a book signing tour for one of his recent childrens books. 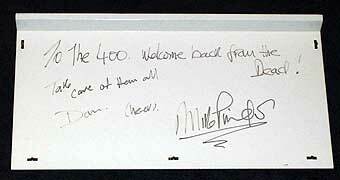 I thought it would be great to drop by and bring in my resurrected Mellotron in for him to autograph. 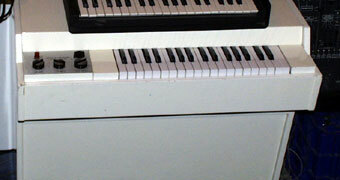 Not the whole Mellotron, just the lid. Sure enough, I arrived and there's a crowd of folks roughly my age, old Moody Blues albums in hand, and here I am carrying the top lid of my M400. It was a fun scene. 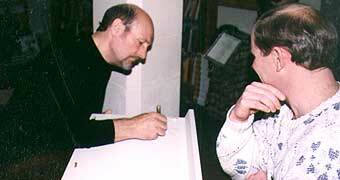 Mike Pinder gave a little talk, read a few passages from his book and sat down to talk to fans and sign things. It was great to have an opportunity to speak to one of my heroes. I had never met, heck seen, Michael before, and he was nicest guy you could imagine. He's been living in upstate California lately. This article is part of Don's Mellotron Page.